Introduction: One-third of the patients with pancreatic cancer present with locally advanced unresectable pancreatic cancer (LAPC). Our aim was to determine survival outcomes and toxicity after FOLFIRINOX (leucovorin, fluorouracil, irinotecan, and oxaliplatin) followed by radiotherapy (RT) in biopsy-proven patients with LAPC. Methods: We analysed a cohort of biopsy-proven patients with LAPC, who were eligible for induction FOLFIRINOX (eight cycles) and subsequent RT (30 fractions, 60 Gy). Eligible patients underwent a staging laparoscopy to detect occult metastasis before the treatment. The primary outcome was overall survival (OS), and secondary outcomes were progression-free survival (PFS), treatment-related toxicity, and resection rate. Results: Forty-four patients were diagnosed with biopsy-proven LAPC. Twenty-five patients were eligible and all underwent staging laparoscopy before the treatment. In three (12%) patients occult metastases were found. 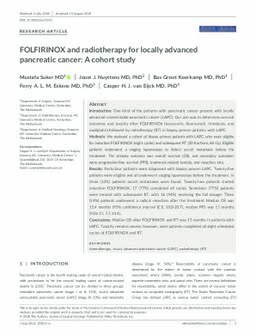 Twenty-two patients started induction FOLFIRINOX, 17 (77%) completed all cycles. Seventeen (77%) patients were treated with subsequent RT, with 16 (94%) receiving the full dosage. Three (14%) patients underwent a radical resection after the treatment. Median OS was 15.4 months (95% confidence interval [CI], 10.0-20.7), median PFS was 11 months (95% CI, 7.7-14.4). Conclusions: Median OS after FOLFIRINOX and RT was 15 months in patients with LAPC. Toxicity remains severe, however, most patients completed all eight scheduled cycles of FOLFIRINOX and RT.